Why doesn't the XR process make Schnabel's Bechstein into a Steinway? The point is, there was and remains something special and unique about that instrument, and playing any piano is very much a matter of a physical interaction with the instrument, not just in the playing of it but the experience of the sound it makes transferred to the player not only through the ears but through the entire body. One gets to know how certain notes can ring out when played a certain way, to have an instinctive feel for the sonorities available, to thrill as sympathetic resonances in the wood and metalwork of the instrument lock into the vibrations of the string and pass through the hands and feet touching it and into the bones as one plays. No doubt Schnabel felt this and more - and I'm sure a lot more keenly than I - when he played his beloved Bechsteins. I've yet to find another Grotrian so I've no idea whether they're all like my own (a model that was discontinued shortly after ours was made), but it's fair to say that piano makers go to a lot of trouble to try to ensure that each piano of a specific model is as close to the others as they can make it. Thus every new Steinway Model D should sound and feel the same to the pianist, unless specific adjustments have been made to it to suit the individual concerned. And Schnabel was a devote of the Bechstein, recorded all the Beethoven Sonatas using one, and when in the USA had Steinway adapt and tweak their own pianos to bring them as close to a Bechstein as they possibly could. This raises an interesting question when one finds the apparent ideal harmonic reference for Schnabel's sonata recordings in those made on a Steinway some decades later by Ashkenazy. I've had more than one communication over the last week wondering whether this isn't a bad thing - won't the tone of Schnabel's piano, its unique timbre, be unnaturally distorted in the process? Does he sound like he's playing the "wrong" instrument? I'm especially interested in this Bechstein/Steinway question as I continue to develop and refine processes such as XR remastering - not least because it could branch out into wider issues: should I be taking into account the type of violin a soloist uses, for example (Stradivarius or Guaneri? ), or the hall an orchestra's been recorded in, when selecting references? It is of course much easier to believe that this makes little difference, given the vintage of material I'm working with and the way the process works, and that appears to have played out over the course of the several hundred recordings I've now produced using this method. But does it stand up in the face of something as specific as this, or should I not have investigated further before committing myself? I think the crucial thing here is to understand that in re-equalising a piano recording I'm altering the overall general sound, using a single EQ setting, which affects equally the tone of the quietest and the loudest passages, and is based on an average tonal response curve generated by analysing in each case here an entire Beethoven sonata. Thus a piano which gets brighter the louder its played will have a limited effect on the overall pattern thanks to the counteracting effect of the quieter sections where it sounds more subdued or mellow. I believe it is these kinds of variations, as well at the touch and feel of a piano under the pianists fingers, which account for much of what we perceive as the differences between pianos - what they do all sound like is "piano" and it's "piano" that I'm trying to recover from the Schnabel, which is currently "distorted, flat, cardboard piano" in its original sound. This is a result of the gross distortions introduced by inaccurate microphones. A piano string, when struck, will generate a root frequency plus a number of harmonics, and regardless of whether that string is placed in a Steinway or a Bechstein, the volume relationship, the ratios of levels between those harmonics and root frequencies, is what immediately says to us "piano". There are subtleties of decay, of varying brightness across the range of pitch and volume, which will denote one make or model of piano from another, but each is inherently a piano and thus has the intrinsic sound of a piano rather than, for example, a harpsichord, or a violin, or a dulcimer, to choose three very different stringed instruments where those harmonic ratios will be very different. It's important to note that XR re-equalisation has no time variable - when a piano keys is struck tone of the note changes as it decays, and the sound of this decay and its duration is something distinctive to each make and model of piano. XR remastering cannot change the way this aspect of a piano's sound quality is reproduced, and it's here that the listener will often hear the greatest difference between instruments. Anyway, this is all a lot of theory - what if you try putting this to the test? A couple of days ago I did precisely that. The pianist Stephen Hough refers to "the greater brilliance and penetration of the Steinway", and notes of Liszt's pupil Moritz Rosenthal: "one of his trademarks was fast, fleet figuration exploiting extreme soft dynamics, and he claimed that it was impossible for him to achieve his effects on the Steinway piano". What if we try using the much more limited range of Bechstein recordings of Beethoven's sonatas fir this series? Will it make any difference, and if so, will it make any improvement? Does the piano have a greater effect, or perhaps the recording itself, the microphone placement, the pianist? If one visits the Bechstein website looking for suggested recordings of Beethoven sonatas, one is directed, amongst others, to the recordings of Lilya Zilberstein. One assumes that the Bechstein company hears qualities in these recordings that are suitably representative of their instruments. Yet despite the supposed "greater brilliance and penetration of the Steinway" we find a significantly brighter frequency response from Zilberstein's Bechstein Beethoven when compared to Ashkenazy's Steinway Beethoven - up by over 10dB at 5kHz, which is a massive difference. Using the Zilberstein recording as a way of fine-tuning the Schnabel to make it more "Bechstein" is quite simply impossible - it's so bright and so full of treble that the 1933 Schnabel recordings just can't handle it and sound dreadfully tinny, hissy and unpleasant. This surely has much more therefore to do with recording techniques, microphone positioning and so forth than it does with the make of piano - perhaps the producers of Zilberstein's Beethoven recordings went looking deliberately for a brighter sound than is usual. It also has to be acknowledged that in the Schnabel recordings the top end of his piano's output simply hasn't been captured very well, if at all, in the 1930s recording process. If there are subtleties of upper-end brilliance here which differentiate instruments then we have to accept much of these finer points may well have been permanently lost eight decades ago. Furthermore the Ashkenazy-XR'd Schnabel is then further "tamed" at the top end a little when reducing all the extra hiss the equalisation process brings up. 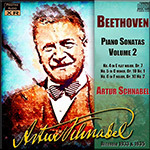 At the very best we can always only achieve an approximation, albeit a much closer one than a non-XR remastering, of the true sound of Schnabel's piano, however accurate the remastering process, because literally not all of what was played and heard by the pianist survives in the discs. All of this leads now me back to my original proposition - that because I'm not applying a series of equalisations which have a different effect at different volume levels, but rather a general EQ which imbues "essence of piano" to Schnabel's recordings, and because a lot of what is heard is down to the touch and feel of the piano and its interaction with the pianist, and because we're dealing with small details in time when listening but vast averages over performances when equalising, the innate Bechstein qualities which have been captured in the Schnabel recordings are retained during XR remastering. To put it another way, the XR process does not and cannot make a Bechstein sound like a Steinway. To achieve such a feat is far beyond the capabilities of this kind of processing, and to be honest I strongly doubt it could be done in a way which would truly convince any pianist or pianophile anywhere in the world. Despite using the Ashkenazy recordings as references for these restorations, what I think I have actually managed to do is to make Schnabel's Bechstein sound ... well ... more like a Bechstein, really. The Sonata in C minor, Op. 10, No. 1, was probably written in 1796, and is dedicated to the Baroness von Braun, the wife of a wealthy Viennese manufacturer, who was manager of the court opera in Vienna. It is a work with which many readers are well acquainted for it has always been a favourite piece with the music teacher, for some rather obscure reason. Schnabel begins well, and throughout the movement, new details that passed unobserved are revealed. It is a fine movement, and Eric Blom gives an exhaustive and interesting analysis. The slow movement is the weak point of this Sonata, and even Schnabel cannot hold our attention. It may be full of ingenious solutions of uncompromising musical situations, but it does not seem worthy of inclusion in this Sonata. Schnabel takes the finale at a terrific speed. The result is (to quote W.R.A.) that one is "so tenterhooked in anxiety about the player bringing it off (for even the greatest man can make a miss), that one can't enjoy the music." The impossible sometimes happens, though how anyone could manage to play all the notes at this speed is a deep mystery to me. Schnabel, however, emerges triumphant."